That’s also the philosophy of the Donner Summit Historical Society. The Society operates a small visitor center near the summit and publishes a fine newsletter. But the bulk of its energy seems to be site-focused. It sponsors a series of hikes into the area which help interested people learn about the place in the best way, perspiring as they are inspired. But it is the Society’s unique linear museum, placed along the historic route of U.S. 40 (and the Lincoln Highway) which educates the bulk of visitors about Donner Summit and the surrounding country. 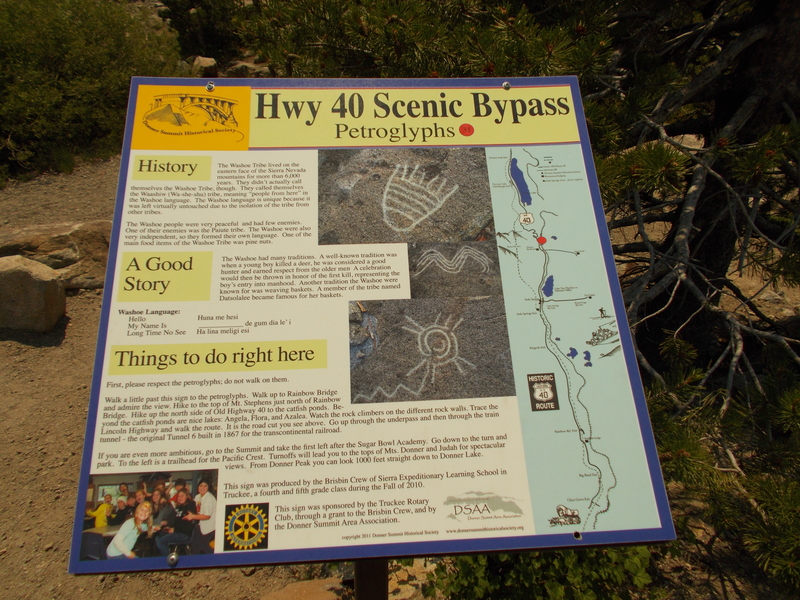 If you’re planning a trip over Donner Pass to Lake Tahoe or Reno, allow time to stop by some of those interpretive signs. They encourage exploration; so plan enough time for a short hike or two as well. You can prepare for the adventure by downloading the text version of the Twenty-Mile Museum Brochure here. George R. Stewart educated the world about Donner Summit country, in the more than 20 languages in which his books were published. The Twenty Mile Museum adds the critical field experience to that GRS education. It’s a great concept and a highly recommended experience.